The body-mind complex is influenced by the impressions of the world that we receive through the senses and motor organs, but its ability to receive and process impressions goes beyond them. Our perception of the world does not stop with the physical senses. Even our sense of the physical boundary of our body goes beyond the senses. You can close your eyes and still perceive yourself in the body. You can also feel when someone is behind you even if that person doesn’t touch you. 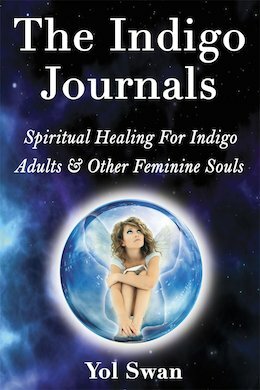 We may be used to thinking of the body as one material entity with its biochemical reactions and cellular information, and of the mind as some abstract concept that is somehow connected to the body through the brain and nervous system (or maybe through the heart), but in reality the body-mind complex is a continuum of divine energy projected onto five layers or planes of manifestation. These layers are known in Vedanta philosophy as koshas, which basically means “sheaths.” Imagine a lamp with 5 subtle lampshades. The light bulb is the Self projecting the light of pure consciousness through the different layers, and the last lampshade is the grossest, material sheath we perceive as the physical body. Each of the layers is contained in the next layer, like Russian nesting dolls. Along with the Self, these form the holistic unity that I call body-mind complex. Obviously, these sheaths are multi dimensional, but I think that even the two dimensional illustration of the koshas I created will help to understand them. 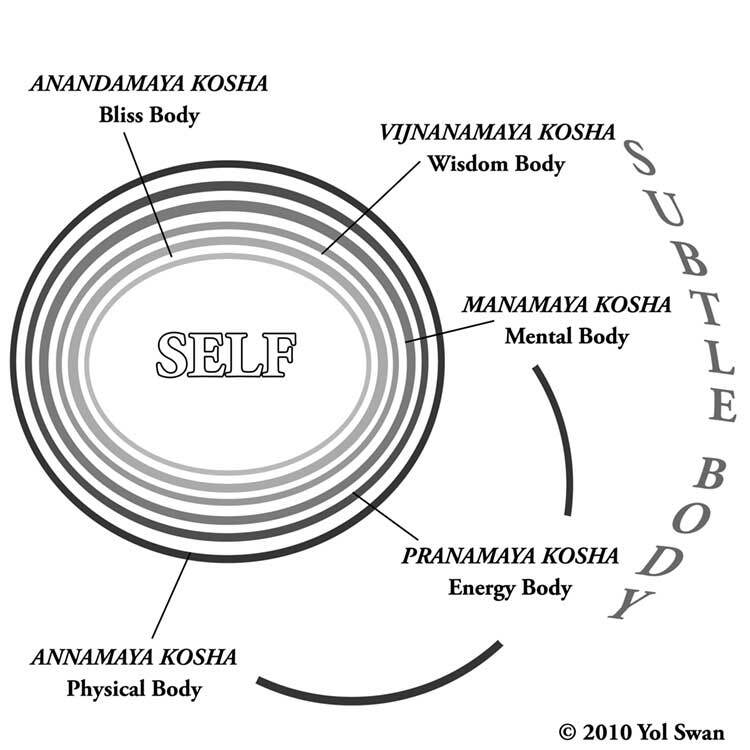 Annamaya Kosha or Physical Body. This is the grossest and most obvious form of crystallized energy. Anna means “food” in Sanskrit, so the name of this layer is a reminder that the physical body is formed and maintained by the food from the earth. Paying attention to what you eat and how you nourish this body will help keep it healthy. What may not be so obvious is that how you nourish the physical body will also affect the other layers, especially those closest to it. Pure, nutritious and energetically clean food (such as that of a vegetarian diet) will promote a purer and cleaner (sattvic) mind. Pranamaya Kosha or Energy Body. This is the next layer, also known as energy body. It is composed of prana, which is the life force that permeates your organism to keep it alive (through subtle energy channels). In reality, prana is present between all the koshas and holds them together, thus enabling all psycho-physiological functions, but it has its own layer as well, to supply the vitality required for the physical body to manifest on the material plane and also to connect this gross layer to the mental body. This kosha manifests as the breath and circulation, and can be perceived and controlled through awareness of the breath. Drugs, tobacco, and alcohol directly affect this energy body because they circulate through the blood, blocking the flow of prana, and therefore have an effect on the mind as well. Manamaya Kosha or Mental Body. This layer includes the objective aspect of the mind (manas) and the senses. This kosha is connected to the physical body through the energy body, giving you the sense of individuality, creating feelings, thoughts, and desires. It is the sheath that absorbs impressions from the outer world, and can also perceive the unconscious language projected through the physical body. These impressions are not processed in this sheath, but on the next one, which is the aspect of the mind that judges and discriminates (buddhi). Vijnanamaya Kosha or Wisdom Body. This is where buddhi, or the discriminating faculty of the mind, exists. So basically, this is where all the thinking and processing happens, but also the level of false ego that gets tangled up in the illusion of the world. It is where both intellect and intuition abide, and with which you can also pierce through that illusion. It is a subtler sheath that you can tap into only when you start looking within and getting to know who you are on a mental, psychological, and even spiritual levels. Utilizing this layer more consciously through constant observation and self-inquiry can significantly change your perception of the world. This is the layer that spiritual practices aim to gain access to for spiritual progress. Chitta, the mind field encompasses both the lower and higher mental planes (manamaya kosha and vijnanamaya kosha). For an overview of the different aspects of the mind, read my post About the Nature of Mind. 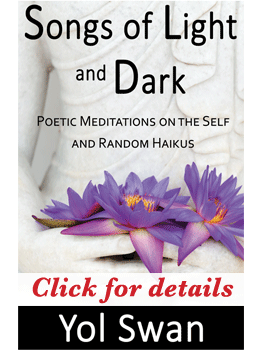 The energy, mental, and wisdom bodies form what is sometimes referred to as the subtle body. It functions as an energetic bridge that lies between the causal body, where karma from past lives gets recorded, and the physical plane where it manifests. It is through this subtle body that samskaras get projected as well. Because it acts as a bridge between gross and subtle energies, it allows you to access different realms of reality and move beyond the needs and desires of the physical body. Anandamaya Kosha or Bliss Body. This layer, also referred to as the causal body in the Upanishads, is the first of the koshas surrounding the Self—Atman, or eternal center of consciousness—and is composed of supreme bliss. Ananda means “bliss,“ but not in any emotional sense. Only the mind can experience emotions, and this layer is beyond the mental koshas. The bliss of anandamaya kosha is inner joy, peace, and love, with no reason or stimulus. It is the bliss of simply being, which can only be experienced in deep meditation or through intense devotion. It has its fullest play during deep, dreamless sleep, and manifests only partially during wakeful and dreaming states. Understanding that the phenomenal world is just a projection of the Self colored by your sense of individuality and samskaras is an important step in creating the emotional distance needed to witness the mind (and the ego), and gradually free yourself from its illusion to attain inner peace. Even though the body layers appear as separate aspects of the body-mind complex, they are always connected and nested within each other and manifest together at once. Most people cannot see this because they are usually too busy with the physicality of the world, but you may be able to perceive them more and more , depending on your temperament, samskaras, and levels of spiritual growth, as you delve deeper into your inner search, or as you develop more devotion on any spiritual path. It is pretty amazing what the universe is willing to show you when you open your heart and are willing to face your internal garbage! The more you focus on the higher, subtler layers, through meditative practices and spiritual tools, the more clarity and discrimination you acquire. In other words, the deeper you go within, the less the world matters and the clearer the illusion becomes. It’s a little bit like watching a movie at the movie theater. You know it’s a movie, but you can get so involved with what is projected on the screen that you forget where you are. You believe the plot, you relate to the characters, it all seems and feels real (hey, those are real actors!). Yet if you can detach yourself from the plot for a moment, you see it for what it is: light projected on a screen. Except that in this case, the light is the Self and the screen is your mind. annamaya,pranamaya,manamaya,vigynamaya,anandamaya ? ?what is aura then? The aura is an electromagnetic field surrounding the physical body. It is prana, so you could view it as part of pranamaya kosha, which is the layer that connects the physical body with the other layers. Prana connects each and all koshas, so it is through prana that the more subtle bodies communicate with the physical body and vice versa. This is not a linear process, though, it is multidimensional. What you mention as “layers of aura” are the different manifestations of this electromagnetic field. They are not the koshas per se, but a projection of the other body layers onto pranamaya kosha. Hope this helps. as manamya kosha is already a distinct layer of the subtle body..
if aura is just a projection in pranamaya kosha then mental layer shouldnt benn there.. The mental body doesn’t “exist” in pranamaya kosha per se, it is projected there, as well as into the physical body. You have to imagine the koshas as nested layers through which the light of consciousness is projected (like a lamp with several nested shades). They are somewhat separate, but at the same time they are all connected through prana and project the light all at once. I recommend “Man and His Becoming according to the Vedanta” by René Guénon. You’ll love it!